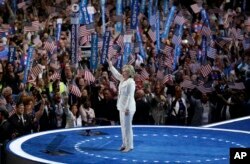 Democratic presidential nominee Hillary Clinton speaks during the final day of the Democratic National Convention in Philadelphia, July 28, 2016. She has made history. She has the domestic and foreign experience. And she has the endorsement of her primary opponent. Now, can Hillary Clinton overcome her historically high negative ratings for a Democratic presidential candidate? Just 38 percent of Americans view Clinton favorably—the lowest point in her 24-year national career—according to a Gallup poll conducted the week before the convention. And in a recent Washington Post-ABC News poll, 54 percent of those surveyed said they had an unfavorable impression of Clinton, with only 39 percent saying she is honest and trustworthy. Part of this impression can be attributed to the controversy surrounding her use of a private email server during her tenure as secretary of state from 2009 to 2013. Trust is an issue for the standard bearers of both major parties. A New York Times/CBS News poll in May found that almost two-thirds of registered U.S. voters view both Trump and Clinton skeptically on that front. Asked whether the candidate is “honest and trustworthy,” 64 percent of respondents answered “no” in assessing each one. With Clinton, it’s not just the email controversy. Analysts say she has to counter the impression she is unfeeling or unable to relate to issues affecting the average American. 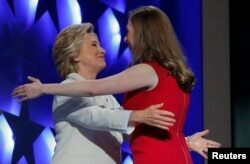 Democratic presidential nominee Hillary Clinton hugs her daughter Chelsea as she arrives to accept the nomination on the fourth and final night at the Democratic National Convention in Philadelphia, Pennsylvania, U.S. July 28, 2016. Speakers at this week’s Democratic National Convention, including her husband, former President Bill Clinton, have aimed to highlight a more personal side of Clinton, recounting her days registering Mexican-American voters, advocating for early childhood education, and being a mother to daughter Chelsea. Democratic strategist Robert Weiner said Clinton must show more of that side to voters while on the campaign trail leading up to November 8. Weiner, a former White House spokesman for Bill Clinton, says while the former first lady, U.S. senator and secretary of state may lack the charisma of some past candidates, she makes up for this shortcoming with her problem-solving ability. “She is incredibly smart," noted Weiner. "She assesses with detail all the policy implications and gets to the root cause of a problem and the guts of the solution better than anyone I have seen, and that includes Obama and Bill Clinton." Georgetown University professor Stephen Wayne said in the tumultuous fight against Republican nominee Donald Trump, being the even-keeled, an experienced candidate may not be such a negative as the race closes in on the election. 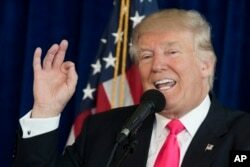 Republican presidential candidate Donald Trump speaks during a news conference at Trump National Doral, July 27, 2016, in Tampa, Fla. Still, in a presidential contest that has seen businessman Donald Trump defeat 16 other fellow Republicans to win the nomination, Clinton also cannot afford to play it safe if she wants to win votes, said Nordlinger. “In an outsider year, you have the absolute queen of the political establishment running against the absolute king of the anti-establishment, so that dynamic favors Trump,” the George Washington University professor said. And the Republican nominee is certain to continue his sharp attacks on Clinton—whether calling her crooked or corrupt. Clinton, too, should be sharp in her counterattacks, said Wayne, author of The Road to the White House: The Politics of Presidential Elections. Clinton must also focus her messaging, analysts say. “She seems a bit distant, disconnected. She needs to figure out a better way to connect with voters and develop a clear message,” said American University historian Lichtman. Michael Kazin, author of American Dreamers: How the Left Changed a Nation, said “stronger together” is not one of them. “Who is stronger together?" he asked. 'She has to identify two or three issues she really cares about and run on those, mention them again and again, and those issues have to have a clear contrast from Donald Trump." More than anything, analysts say Clinton and her campaign must get out the vote in order to win the presidency for Democrats.